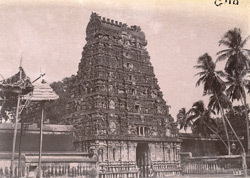 Photograph of the East gopura of the Shiva Temple at Tiruvadi, taken by Alexander Rea around 1890. This great Shiva temple, known as Dakshina Kailasam, covers an area of 15 acres and consists of five enclosures or prakarams and a seven-tiered tower or Rajagopuram completely covered of sculptures of the various divinities. Many inscriptions were found in the temple, which relate it to rulers of the Chola, Pandya and other dynasties.